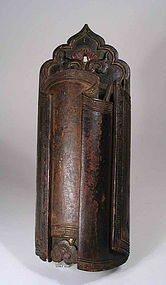 Chinese Scroll Form Wood Incense Holder, 18th C.
Please refer to our stock # SAO212 when inquiring. DESCRIPTION: A very old Chinese wooden incense holder, crafted in the form of a partially unrolled scroll that bends and folds to form the container. On the edges of the “scroll” is a relief carved key pattern border with traces of gilt; the worn lacquer surface still shows the original designs of a bird, flower, bamboo and Chinese characters. The top of the flat back plate has a shaped and carved design with a center hole for hanging. On its reverse can be seen the old, hand forged iron nails used to fasten the two pieces together. A handsome, unusual piece dating from the mid Qing Dynasty, 18th C., with surface showing aged wear. All the wooden parts are sturdy and intact. DIMENSIONS: 13” long (33 cm) x 5” wide (12.7 cm).